Is Syria the new Vietnam? US Secretary of State John Kerry as a young man protesting the war in Vietnam. With Congress preparing to vote on a military strike in Syria, the comparisons between Vietnam and Syria have been growing. And it would seem the ingredients for the next Vietnam War are all there, from chemical weapons (with sarin replacing Agent Orange) to a refugee crisis that has displaced 2 million people. Obama’s “calculated indecisiveness” on a Syrian strike can be likened to Eisenhower’s reluctance to attack Vietnam after Dien Bien Phu, France’s dramatic defeat in 1954, writes Jeffrey Frank of The New Yorker. Even some of the actors from the Vietnam War are present in the lead up to a strike on Syria, with Vietnam vets now in prominent government positions. The most recognizable of these is Secretary of State John Kerry. Several pundits have pointed out the irony of Kerry leading the support for strikes in Syria. The Vietnam vet was once one of the most recognizable anti-war figures in the country as a representative of Vietnam Veterans Against the War. In 1971, he became the first Vietnam vet to testify before congress about the war, during the Fulbright Hearings. 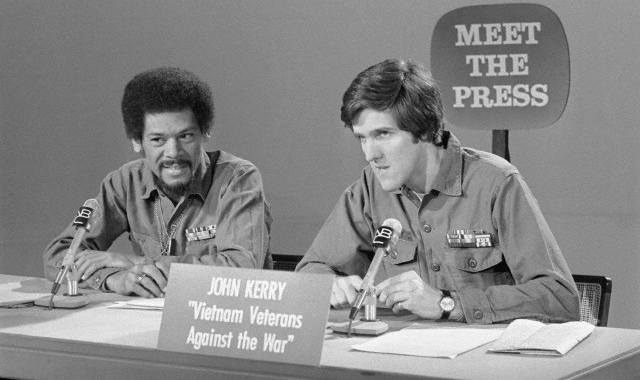 Kerry’s anti-war rallying in the ’70s didn’t translate to a lifelong commitment to pacifism, however. Instead, Kerry has used his experience in Vietnam to help convince legislators of his seriousness about strikes on Syria. In a Senate Foreign Relations Committee meeting last week, Kerry brought in two additional high-level veterans to make his point: Defense Secretary Chuck Hagel — a Vietnam vet — and Army Gen. Martin Dempsey, chairman of the Joint Chiefs of Staff — an Iraq vet. “You’ve got three people here who’ve been to war. There’s not one of us who doesn’t understand what going to war means and we don’t want to go to war. Andrew Bacevich, a Vietnam vet and historian at Boston University, is one of the more eloquent veteran voices against the possible war in Syria. Bacevich served in the US Army in Vietnam in ’70-’71 and his son died while fighting as part of the US Army in Iraq in 2007. He spoke in the most recent episode of Moyer’s & Company about the links between the wars in Vietnam, Iraq and Syria. Tomorrow, Bacevich will release his latest book, “Breach of Trust: How Americans Failed Their Soldiers and Their Country.” You can read an excerpt of that book here on Bill Moyer’s website.